Height rainge: up to 32"
I was very pleased to receive the Maxi-Cosi Mico Max Plus Infant Car Seat from weeSpring Parent Panel. I love its safety features, especially the stability leg and side impact support. It also looks much classier than many other car seats and I appreciate how easy it is to install/remove the padding. I also like the extendable hood, although it only extends it a couple of inches. It easily snapped into my Maxi-Cosi stroller. Also, although the base is quite heavy, the seat itself is lighter than others at the same price point - something I definitely appreciate with how much I end up carrying this around! The only downside is the base is quite large so may not fit as well in a smaller vehicle. As a parent of a 5 month old boy and 2 older girls, car seat safety is priority. I was given the Maxi-Cosi Mico Max Plus Infant Car Seat to try as part of the weeSpring Parent Panel. The car seat looks nice, has a great canopy that extends very far to protect the baby. Installation of the car seat was easy, there was no movement side to side, although it seemed to have a lot of movement up and down. We were very excited about this new car seat and when we went to use it for the first time, my son was too big for it. He isn't huge but he's a pretty big boy. His shoulders were too snug and he was uncomfortable. At 5 months, he was 17.5 pounds and 27.5 inches. Unfortunately, we were not able to use the car seat! Had we got the car seat when our son was an infant, we would have loved it! The safety ratings for this car seat is amazing and that was the most important thing to me above looks and whatever else but this car seat has it all. The installation was very smooth and easy. I love that it has the stability leg for the extra protection. The fabric is soft and luxurious for baby's sensitive skin, and it is breathable. The handle is easy to carry and I love that it's curved in design so I can see by baby better. It's not heavy like the other similar car seats. They managed to pack safety in but still be on the lighter side. The large shade is fantastic. I also have the Lila stroller system and it clicks so easily that traveling is a breeze. Thank you weeSpring Parent Panel for sending me this brilliant car seat. A safe and sleek ride for your precious cargo. I received this from the weeSpring Parent Panel.This is an extremely attractive car seat that's clearly well made with a lot of soft padding that creates a comfortable and stable seat for our infant. One of our favorite features is the ergonomics of the handle for carrying-it makes it very easy and comfortable to carry the car seat in and out of the car. It also clips in and out of its base in the car and in and out of the stroller very quickly and easily. The extra long sun canopy is great, too. Super lightweight + great seat! Overall I love the car seat and feel very safe having my infant using it. The seat is lightweight and it's handle design makes it easy to carry. My FAVORITE feature is the flip-away buckle, which makes it so easy to quickly buckle in my baby safely. With two toddlers running around, speed is a big deal! The installation process is easy, we quickly installed the seat with no issue and I love the added stability bar. It's also very easy to use with my stroller system, I can just clip the car seat in an go! The fabric cover and hood mechanism could use improvement. The fabric on my car seat is never taught and it always comes undone from the back. The hood mechanism also isn't very strong, so when I extend the hood to cover my child, it often snaps out of the "lock" position. Overall a great seat and I would recommend. 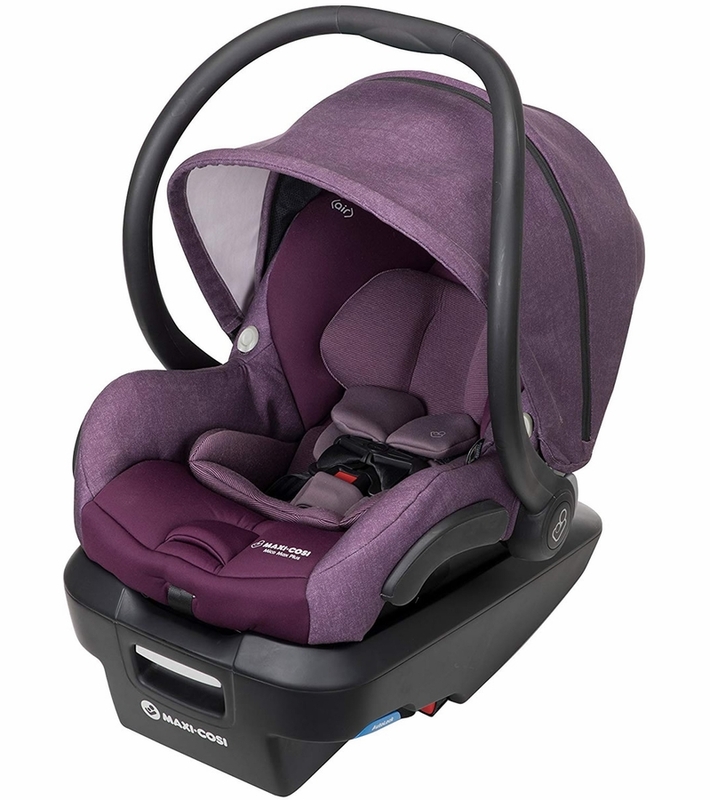 The Maxi Cosi Plus car seat was provided to me via the WeeSpring Parent Panel. 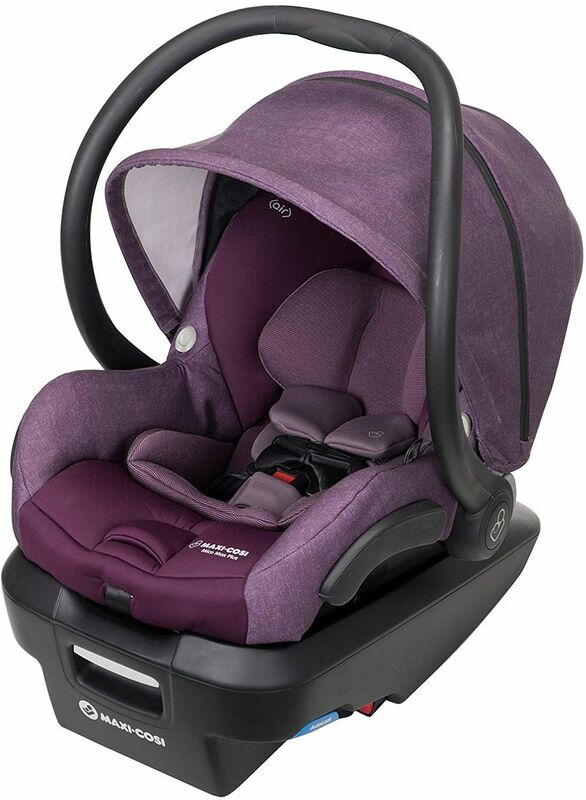 Great car seat from Maxi Cosi! 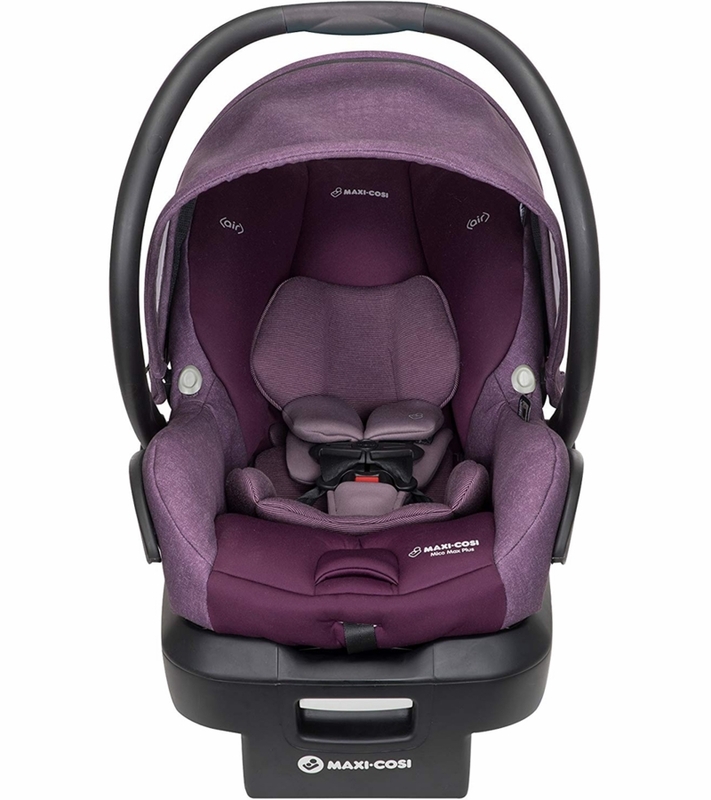 I really like the new Maxi-Cosi Mico Max Plus Infant Car Seat! This is my second infant car seat with my second child. I used the Maxi-Cosi Mico 30 Infant Car Seat with my first child. I love how comfy the padding is in the seat for my baby and the padding along the straps. The canopy of the car seat is a nicer fabric and has a zipper that exposes mesh panels, which will be perfect for warmer weather. The car seat base is easy to install in the car, and I love that the base has the load leg feature for added safety. The car seat is really lightweight and easy to carry around. The car seat also easily clicks into the adaptors on the Maxi-Cosi Lila stroller, so it is really easy to use with that particular stroller, or any other stroller with adaptors. This version from Maxi-Cosi is much better than the older car seat I was using from them, and I am very happy with it! There are two features that I see as minor cons, however. One is when I first took the car seat out of the box I thought it was really difficult to adjust the straps to fit my baby, and it took a lot of monkeying around on my part to figure that out. Also, the carrier handle is really difficult to adjust up and down, and does not go down flush with the canopy. It always gets stuck on the canopy and I have to move the canopy to get it down. I'm hoping with more use the carrier handles become easier to manipulate. All in all, this is a really great car seat that I am very happy to be using with my child! Thanks to the weeSpring Parent Panel for providing me with this Infant Car Seat! This car seat is great! I LOVE that the seat fabric is machine washable...and so easy to remove and replace. I found it very easy to install the car seat base into our SUV. I also really like the stability leg and the easy to use level on the base. Both made installation a breeze and provided a sense of security to this anxious mom. The seat is super lightweight too, much lighter than the car seat we used with son. I anticipate this being very important as I juggle an infant and a toddler. I thought the zippered canopy is a wonderful touch. It's nice to be able to pull the canopy almost completely over the seat, either to shade the baby from the sun...or from curious strangers. There was one small issue I had with the canopy. It seems a little flimsy and doesn't seem to pull down in one swift move. Rather, you have to pull on each side to make it even. Finally, attaching to our Maxi Cosi stroller was very simple, for added convenience. Thanks to the weeSpring Parent Panel for providing me with this Infant Car Seat. Getting the baby into any car seat is a huge struggle for us, so the moment I opened the box for the MaxiCosi Mico Max, I was in love!!! A friend had recommended that I get a MaxiCosi as soon as I told her I was pregnant. I didn't take the advice, and now I have experienced firsthand why she was so adamant! Basically this car seat made me realize I had my kid riding coach when she could have been going first class! The seat is plush and extremely soft, with great support. The straps are a bit gentler/higher quality than the usual, so it is gentler on her sensitive skin. It holds her with a comforting (and probably safer!) soft pressure, so it's the sense of being cuddled vs. being forcibly restrained. The base is hefty and doesn't wiggle the way my other car seat base does. The seat snaps in very securely to the base. There's no question of whether it's fixed - you hear it! As our child gets older, she's more aware of her car seat (and distaste for getting into it! ), so I love that this is comfortable and safe but ALSO lightweight, making it easy to transport her. As a petite woman, every pound I'm carrying on my arm matters, so that was a huge benefit. It clicks easily into our Lila stroller (also part of the WeeSpring Parenting Testing Panel, another product we have loved). WeeSpring provided me with this product to review - I'm now a convert!!! Lightweight modern infant car seat. When I purchased an infant car seat for our first child, I did not think the weight of the car seat would make that much of a difference but I quickly regretted not considering the importance of that. For our second child I am so happy to have the Mico Max Plus because I do not have to sacrifice the safety and high end features for a lighter weight car seat! Especially now that we have to wrangle a toddler along with a newborn! There are thoughtful safety and aesthetic details that we love about this car seat-- such as the safety leg stabilizer and the modern and fashionable material. I also LOVE how easy the fabric is to remove so that you can wash it. It also as an extendable sunshade, which is a must for us since we live in a year-round sunny state. We also found it very easy to use with different stroller systems. It not only pairs seamlessly with the Maxi Cosi Lila stroller that we have but with essentially any of the other luxury strollers (grandparents have another brand and it also works well with that!). The installation was average, I wouldn't say it was particularly easy or difficult. While I do like the extended sun shade, I will say that when you have it extended all the way it seems a bit wobby but it does get the job done. Overall, the features, ease of use with it's stylish appeal outweighs any of the small downsides.Thank you to weeSpring Parent Panel for sending me this car seat to use and review! Beautiful car seat & easy install. Very easy to install the base in my car as well as be able to pop in the car seat. I really like the integrated belt lockoff for easy and secure seat belt installation. The red-to-green level indicator on the base provides confirmation & confidence of proper installation, which is very helpful to know you've installed the base properly. Easy to carry & use with Lila stroller. Easy to carry and not crazy heavy which is nice once your infant starts gaining more weight. Also very easy to use with the Lila stroller. Easy to attach & release. The fabric is soft, comfortable & breathable. Beautiful, high-end fabric. The car seat seems to be supportive and fit an infant quite well. The Air Protect technology is great to have-providing extra side impact protection. Which for me is the most important feature-keeping baby safe & snug. I love the Flip Away Buckle that doesn't get in the way while getting baby in and out of the seat. I love this feature on my Maxi Cosi convertible car seat too! No more digging under your child to get the buckle! The shade is nice & large. I was hoping for a smoother open/close, but definitely not a deal breaker at all though. Overall, this is a beautiful car seat and has some wonderful features. Thanks to the weeSpring Parent Panel for providing me with this product. Easy install and perfect fit for baby! This infant car seat is definitely top of the line - and the features are obviously well designed and thought out. We can tell the material is quality and very comfortable for our two month old. She can sleep for four hours at a time in it! I'm a huge fan of the fact that we don't need the car base to use if since we are used to running into Ubers/Lyfts quickly. We also like that the handle goes back easily so we can put the baby in and out without bumping her head at the bar. Little details like that really makes this a well designed infant seat. It also fits seamlessly into our Lila Stroller! We received the product as part of the weeSpring Parent Panel. Beautiful and safe car seat! Thanks to the WeeSpring Parent Panel for providing our family with this gorgeous and safe car seat. It was so easy to use with our Maxi Cosi Lila Stroller, Maxi Cosi has taken the guess work out of it all. The plus' are all the beautiful details and aesthetics and the safety features. We LOVE knowing our little one has the air protect. Love the extendable canopy. The only downside is how deep and long the base is, it seems so far off our SUVs seat but still level. It also isn't super easy to install, especially for first timers. This car seat is so much lighter than others out there. The handle is very ergonomic and makes it easy to hold. And our little one seems so secure and snug in it even from the first days home from the hospital with the infant insert pillow. From the first moments of using this car seat you can tell it is top of the line in both safety and beauty! We love the car seat, but would recommend a tweak or so on the base because it isn't easy to install like others we have used! Thank you WeeSpring! A great carseat, keeps our baby safe and snug! We had another carseat but were not comfortable with the way our baby fit in it. When the Mico Max arrived, we put her in it to give it a test and were immediately impressed with the way she was held. The newborn insert is probably our favorite feature, easily the top of its class and a huge upgrade from anything we've used in the past. Her seating position was great, and she was supported all around. We're confident she is safe, secure, and comfortable when buckled in. We especially like the way her head is supported - critical for a newborn! I installed this carseat using the LATCH system and setup was a breeze. The base was very easy to install, and the carseat clicks in and out easily. 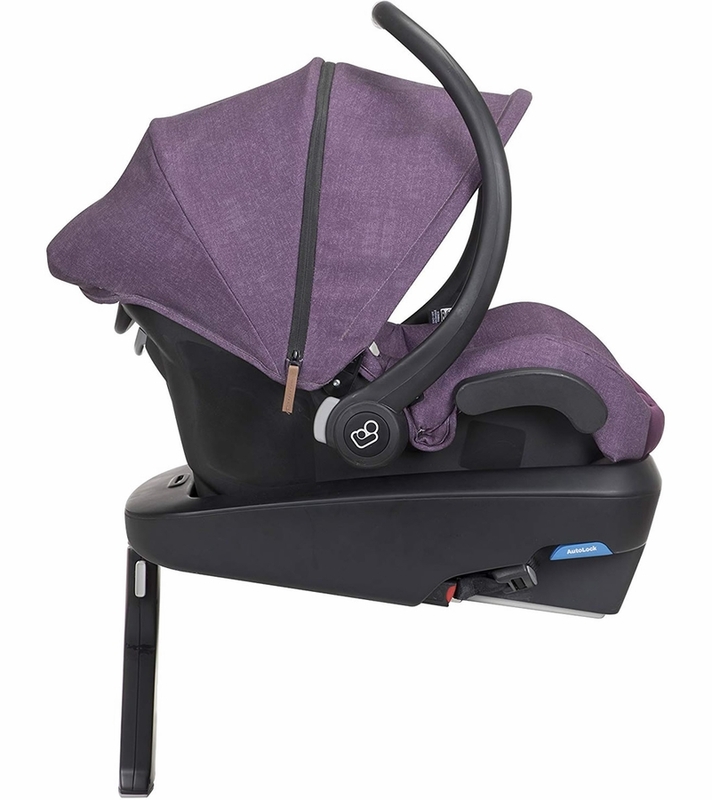 It also pairs well with our stroller - a Maxi Cosi Lila. The whole system has been a huge plus for our family. We're confident our daughter is safe, secure, and comfortable wherever we take her. We received this carseat as part of the weeSpring Parent Panel. High quality, easy to use, and comfortable infant car seat! Easy to use, light, very safe & luxurious. LOVE the shade. Newborn insert included! Thanks WeeSpring Panel for sending to us! I'm a first time, new mom - so bringing my little one home from the hospital in the carseat was something I was really nervous about. No need for those nerves with the Micro Max. The infant insert is such a nice feature and so snug that I felt like she was perfectly secure from the very beginning. We don't own a car, so I can't speak to how the base works, but installation in cabs directly with the seatbelt has been remarkably simple so far. Clicking in and out of our stroller base has been easy as well, which is great for days when we're running errands. Learning all of the latches and releases was a bit tricky at first, but that seems worth it for the safely. I haven't needed to wash any of the pieces yet, but I love that the fabric parts are easily removable and machine washable - I expect that will come in handy soon. Overall, I'm really pleased with how well the Micro Max has worked for our family so far! I received this beautiful infant car seat to review from the weeSpring Parent Panel. The first thing I noticed and loved about this car seat is that it's very light weight, which is so nice. It's also very stylish - the fabric is soft, good quality and I really like the color (we got nomad gray). The head and body pillows are great inserts and help to make the car seat snug and cozy for baby (but are removable for when she's bigger). The carseat is relatively easy to use with the stroller we own. We installed the base in our car using the LATCH system, and it really was very easy to install. But the one thing about the base that we aren't quite understanding is the stability leg. When we tried to use it, it lifted the front of the base up so that the angle of the base was no longer correct. Another con is that the base and car seat itself is a bit long. We first tried installing this car seat behind our drivers side seat, and didn't have room without the front seat pushing against it, so we ended up moving it to the passenger side. This doesn't present a huge issue for us, but could for someone who needed to have two infant seats installed a the same time, or has a more compact car. We were excited to receive this car seat as a part of the weeSpring Parent Panel. As a safety-conscious momma, I'm always looking for the best option for my babies. I was ecstatic when the weeSpring Parent Panel sent me this car seat to try because of the great safety ratings and numerous features. A few of my favorite features are the canopy, the stability leg, and the high-quality fabric. The canopy offers the most shade of any car seat I have tried. The stability leg is a genius addition to keep the car seat and base stable during car rides. It gives me additional peace of mind that my baby will have a comfortable and safe ride. The cushion fabric is smooth, durable and easy to clean. I also love the design of the handle which is tall and easy to grasp making the weight of the car seat easier to bare when walking. I can easily insert and remove the carrier from the stroller and easily install it in the car. I love the soft, plush cushions that surround baby's head and body. The infant insert for this car seat must be the best and most comfortable on the market. I know these cushions add to the safety of the car set and baby's overall comfort. However, my baby at only five months old has already outgrown these cushions width wise. His head barely has any room to move. The straps will not let out much more to accommodate his body size. He is in the fiftieth percentile for weight; I am perplexed on why he has already outgrown this car seat that claims to cater to babies up to thirty pounds. Because of his discomfort and inability to fit into the seat at only five months old, I cannot give this product five stars. I would expect a baby of his age and weight to fit perfectly into this product until at least twelve months of age. I was given this product to try as part of the weeSpring Parent Panel and I couldn't be happier with it! 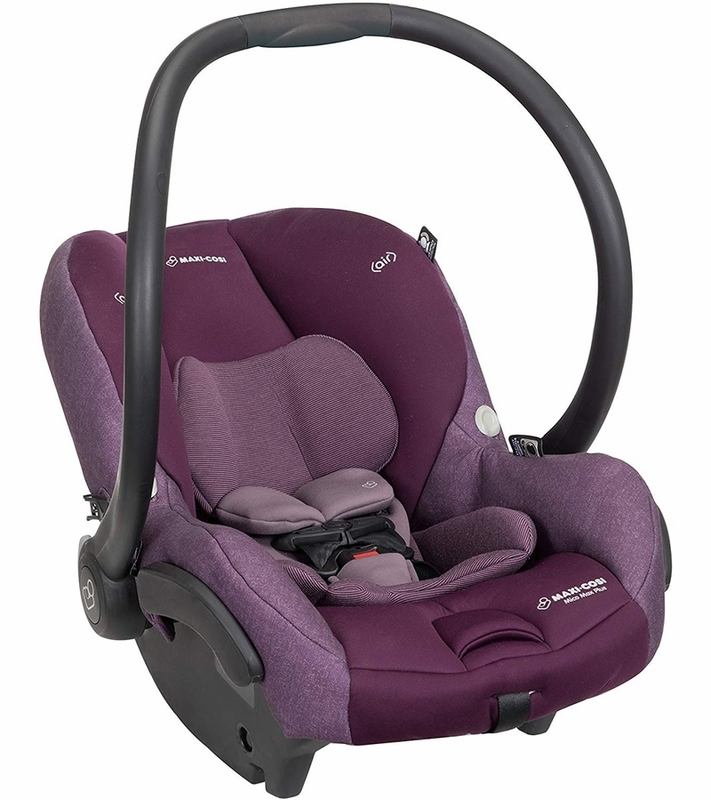 This car seat has it all- comfort, beautiful design, lightweight, safe and easy to install. I have the Lila Modular stroller system and this fit into the stroller perfectly. The safety rating is what I like most about this seat! It exceeds all federal ratings and has extra built in head and neck protection. This makes me feel confident putting my infant in this seat as he doesn't have good neck control yet. He is protected from his head to his legs! I also love the self wicking fabric as it keeps my baby dry because he tends to overheat easily. We were able to get this installed into our car very easily. I would definitely recommend this car seat to anyone looking for a car seat that has it all. This is a really nice carseat that is super comfy for infants, has high quality fabrics, and works with my Maxi Cosi stroller system. I received this car seat from weeSpring Parent Panel. Thanks to the weespring parent panel for providing me with this product. It's such a lightweight infant seat and the material is amazing, easy to clean and so soft. I love the extra bar the bottom as it makes it super easy to get in and out of the car and stroller. I used it with the same brand stroller so it fit perfectly. I use this car for my third child so I've had experience with other brands before and it doesn't even compare, this is a luxury version of infant car seat. The design is so smart and fashionable. Overall amazing infant car seat and I highly recommend! So many features that I hadn't seen offered before! The Mico Max is definitely a top of the line car seat. The previous car seat I had was functionable but did not have the comfort and look that this one did. This carseat is made with nice materials and my infant looked comfortable in it right away. I was able to use this pretty easily with the Maxi-cosi Lila stroller. I would say the only downfall is removing the car seat from the stroller, the hand placement is slightly awkward at first. Other than that, figuring out the adapters for it were simple and quick to figure out when using with the stroller. I definitely appreciated the extra head support that this car seat offered, and that safety ratings were high as well. The directions for the base installation were clear as well which made the whole process streamlined. It is also nice that you don't need to use a base and can be installed with a seatbelt only as well, that is a perk so that other family members don't need to purchase a base for their cars as well. I would say my favorite feature for the car seat was the material it is made of and how I could tell my infant was supported appropriately and safe! If someone is looking for a safe, nice looking, and comfortable spot for their baby, I would say this is it. I received this product was part of the weeSpring Parent Panel. Maxi Cosi does it again! I must say that I've always been a fan of Maxi-Cosi infant car seats. 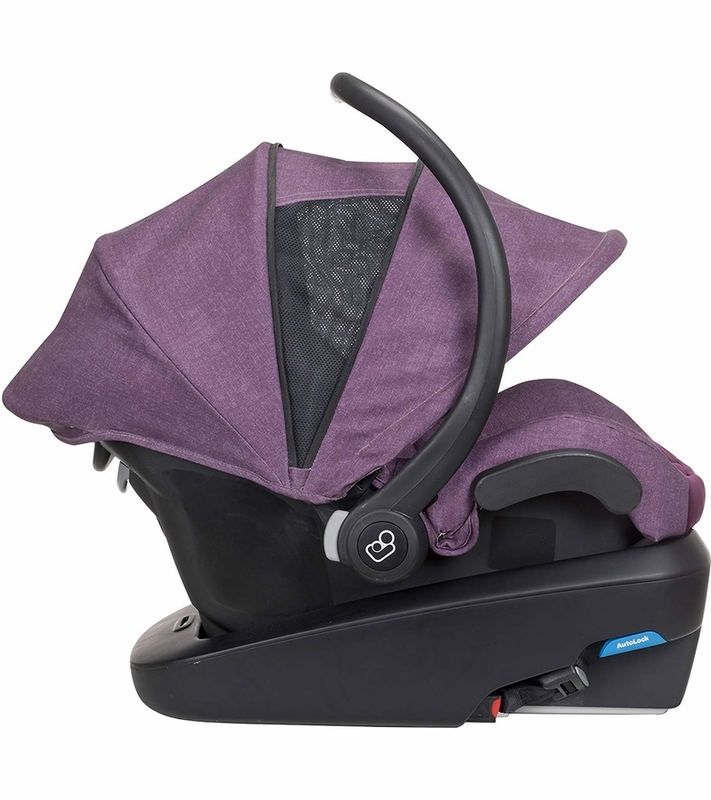 I used the Maxi Cosi Mico AP for my first, and it was truly one of my favorite items. As with the previous car seat, this Mico Max Plus ergonomic and smooth curved handle is one of my favorite features of the Maxi-Cosi seat and it makes taking the seat out of the car more manageable for a petite mom like me. The only thing is because it accommodates infants up to 30lbs (vs. 22lbs for my old seat) it is a little heavier, but completely normal weight for an infant seat. It was fine installing it onto my stroller frame. This seat has a load leg which significantly reduced rocking of the seat base forward and back, and gave me reassurance that my baby is safe. The melange fabric style is so stylish and is totally something that hip moms with an eye for aesthetics would be attracted to. It would be nice to see a navy/indigo or green option later on along with the purple, black and gray. The zip-up canopy was an excellent update and definitely is something that I would consider when choosing a car seat. The seat fabric and cushioning is exactly as I expect of Maxi Cosi--soft, comfortable and cozy; my baby just snuggled up very well into the seat. Even my toddler wanted to keep climbing in. Compared to the older model that I had been using, the installation of the seat base was significantly easier because it secured the seat belt strap along the base and it had the level indicator so we didn't have to guess whether it was angled correctly. The only thing that would have made it easier would be the rigid LATCH system for the base. Thanks to the weeSpring Parent Panel for providing me with this Infant Car Seat. Thanks to the weeSpring Parent Panel for providing me with this�‚ Infant Car Seat! The Mico Max is a beautiful car seat that my newborn son fits in comfortably. It is extremely easy to use with my Maxi Cosi Lila stroller (all it takes is two clicks of the car seat adapters). The safety features of this seat are amazing; my favorite feature is the newborn insert that helps keep my little man secure. One gripe was the car seat base was difficult to install because it is so large. The base went over my seat and when I would pull the leg out, the base was no longer properly balanced. I found it easier use the car seat with the seat belt. I found myself nicely surprised by the design and safety of this car seat. 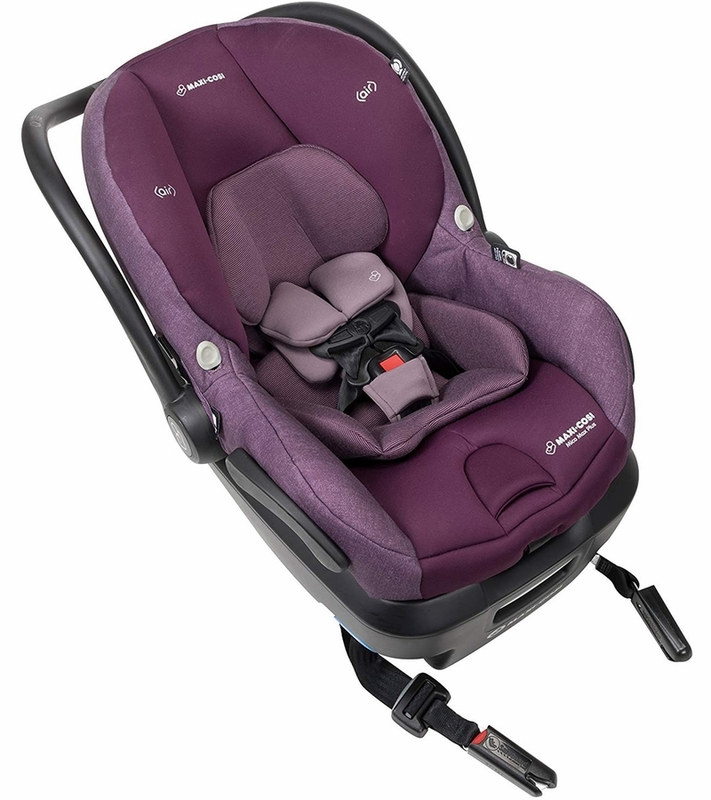 The Maxi-Cosi Mico Max Plus Infant Car Seat is a great choice for a newborn/infant. The fabric is beautiful and the look of the car seat in the matching stroller system garnered lots of compliments on my outings. Also the soft fabric design on the belts are protective for baby's neck. The car seat design makes it easy for me (I have a small frame) to take in and out of my car. This is extremely important to me as I drop my infant off to my Moms daily. The car seat easily clicks into the base and feels very secure. The harness system securely held my infant in place, was easy to tighten and loosen, and although my baby is small the seat held his head nicely on place even when he fell asleep. Installing the base was simple and easy and no different then installing any other car seat base (I have used 3 different car seat systems). The base is slightly on the larger size which was fine for my truck but less ideal for my husbands smaller sedan. The sun canopy is wonderful and does a nice job of protecting baby from the elements. My favorite part of the car seat however is the light weight design. This is the lightest car seat I have owned. With two kids, sometimes walking my toddler with one arm and holding the car seat in the other, this is extremely important. I also loved the versatility of this car seat as part of the travel system. 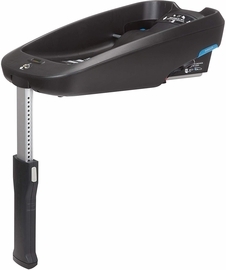 It clicks into the stroller just as easily as it clicks into its base. All in all this car seat is a win for my baby. Truly beautiful design and nicely compatible with its travel system which may seem like an obvious design win but is not true for some travel systems in the same price range. Thank you to weeSpring Parent Panel for sending me this stroller to try and review. This seat is so great. It is so light and easy to use. It was a breeze to use with my infant. I couldn't believe how light it was and made it super easy to get it in and out of the car. The design of the seat is great and easy to adjust which is super important. My infant was very comfortable in the seat and it seems super safe and I wouldn't hesitate to have her in the car if I had an accident as the seat feels very sturdy. Overall, I highly recommend the seat! Thanks Wee Spring Parent Panel for the seat! Comfortable and easy to install. The Mico Max Plus is extremely comfortable and easy to install. Baby sleeps well in it and the materials are high quality, durable, easy to clean and breathable. While the car seat itself I love, I am not a huge fan of the base. The base is much longer than our current car seat so the footprint is bigger. We have a minivan so it's not a huge deal but it would be pretty tight if you tend to place the infant car seat behind the driver's seat and the driver has longer legs. Also, I'm not sure the stability leg helps at all in stabilizing the unit. The car seat actually feels less secure with more wobble than my current infant car seat that doesn't have a stability leg. There is not an audible "click-in" when placing the seat into the base which makes me difficult to tell whether or not it properly attached. Overall, the car seat is a nice option but definitely not my favorite out there. I was given this Infant Car Seat to try as part of the weeSpring Parent Panel. The Mico was easy to use and had very nice materials. I used the Mico Max with the Lila stroller. The material quality was excellent and I felt my daughter was very comfortable in the seat. My favorite item about the car seat was ease of use in getting it into the car, install, and portability with the stroller. The car seat was a bit heavier than I expected. The adjustment strap was long and dragged on the ground when I carried it. Overall this was a wonderful car seat. It fit in my compact car nicely and I loved the canopy. I received this product from the weeSpring Parent Panel. I like how easy and simple it is to install this carseat into my car and on the Lila Modular Stroller System. You put the carseat attachments on the stroller and just move the carseat to the stroller from your car. In this way, you never have to wake up your baby from sleeping and you get to enjoy whatever you do more peacefully in mind. Of course, babies sometimes wake up no matter what. This carseat will help the likelihood to decrease. The safety feature of this carseat is outstanding from other brands. Their Flip Away Buckle does not get in the way while you get your baby in and out of the seat, their Air Protect technology provides great side impact protection around the head and extends down the side, and Anti-rotation stability leg offers an extra safety during a crash by reducing movement for maximum head and neck protection. When we have our newborns in the car from the hospital, none of our carseats in the past seemed safe or comfortable. However, this carseat will absolutely provide both safety and comfort with confidence. I am excited to use this carseat for our next baby. The best of all, this carseat has fabric that is easily removable and washable by a washer and a dryer. This makes the chore of cleaning the carseat really easy. I honestly hate cleaning my kids' carseat for vacuuming, handwashing and drying since it takes work and time. However, this carseat will be a game changer. I just need to remove the fabric and toss it in the washer and dryer. Machines will take care of the rest. I was able to receive this product from the weeSpring Parent Panel for free opportunity to try. Safe, secure and stylish car seat to feel good about! We got this car seat for my mother, who provides childcare for our infant - we have another Maxi Cosi car seat we love, and so wanted another car seat from this brand that we knew we could feel good about for safety and comfort. This rear-facing seat is an outstanding mix of style and safety. The stabilization bar stops this seat and base from shifting at all, and the material and padding are both extremely stylish and comfortable feeling. My baby is very supported and seems happy and comfortable when she is in the seat! I would recommend this to anyone! This car seat is so beautiful: color , material, everything!!! Material has a very good quality! More imroved features! Comfortable! Very fast shipping! Does this work on Quinny Zapp Flex Plus? Also what is the difference from Mico Max 30?